Michael Field has been thinking about Tonga's political crisis. Field hasn't been impressed by the embattled government of 'Akilisi Pohiva, but he doesn't care much for the royals and nobles trying to overthrow Pohiva, either. I don't know if Field would agree, but it seems to me that King Tupou VI has gambled a lot by dissolving parliament and calling new elections a year ahead of schedule. Prime Minister Pohiva has accused the king of a coup, and has signalled that he and members of his government will stand for re-election. It is quite possible that, when they go to the polls, Tongans will feel that they are being asked to choose between king and the prime minister, between monarchy and their democracy. In the 1990s and early 2000s, there seemed to no way to reconcile the near-absolute monarchy with the aspirations of Tonga's pro-democracy movement. The elderly Tupou IV was determined to prevent any erosion of his powers, and so advocates of democracy began to resort to radical actions, like a general strike and a mass demonstration and, eventually, the riot that destroyed so much of Nuku'alofa in 2006. Tupou VI's brother and predecessor was an eccentric and unpopular man, but he managed to stabilise Tongan society by ending the contradiction between the monarchy and democracy. By giving away many of his powers and allowing a commoner to become Prime Minister, Tupou V made Tongans feel that they could have both democracy and their monarchy. Now, though, Tupou VI seems to have recreated the dichotomy of the early 2000s. 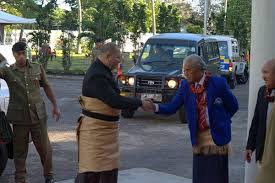 Tupou VI has also gambled by linking himself so tightly to Tonga's nobles, who are far less popular than the monarchy. Many Tongans are critical of the way a third of the seats in parliament are reserved for nopeli, and of the role that they are allowed to play in the distribution of land and other resources. Yet Tupou VI has let noble Lord Tu'ivakano become the salesman for his attempt to oust 'Akilisi Pohiva. Pohiva's government has not been very efficient or consistent, and is far from universally popular. But many erstwhile supporters of Pohiva may turn out to vote for him out of a sense that the nobles and the king are trying to strangle Tonga's democracy. And if Pohiva is re-elected in November then the credibility of Tupou VI will be devastated, and the very future of the Tu'i Kanokupolu dynasty that has ruled Tonga since 1852 will be at stake. Would Tupou VI allow a re-elected Pohiva to take office, with all the humiliation that would entail, or would he annul the election and return to the old days of direct rule? Neither option promises stability for Tonga. The enemies of Tongan democracy has been manoeuvring for some time. I wrote about what Maikolo Horowitz's calls the kingdom's 'Weimar period' here. I really appreciate this post as it has given me great insight about the subject. Oi Agradeço pela ótimo artigo, porém, gostaria de informar que tenho um site com posts semelhantes com o seu blog. Desta maneira, gostaria de compartilhar-lo com vocês. friv jogos. Abraços!!! wow, i have no idea about this meeting. It was really amazing. It is really an important point to consider when it comes to going through both. This meeting can certainly make changes to the international politics. I don't know why media is generous meeting so much.